A few nights ago I heard that the musician Prince died. I was very familiar with Prince’s music and his career as my sister was a huge Prince fan back in the 1980′s. I wasn’t a fan but did recognize him as one of the most talented rock stars ever. He was worshiped by his fans and greatly respected by the rest of the music industry. He was as big as Elvis for our generation. I just finished listening to Clyde Lewis “Sometimes it Snows in April, The Tale of an Apocalyptic Prince” as I trusted Clyde to do a very respectful and well researched tribute, while not missing a single detail. Clyde is one of the “weird” people I like to listen to on occasion and he does a good job. I don’t ever agree with all of his “opinions” but like I have said many times, I am an evidence guy and Clyde never disappoints with his evidence. Like Clyde, I am disappointed by all the click-bait you-tubers and others who rush in to DILUTE the artist Prince’s life and death. There is a LOT to learn here without talking about unproven, baseless and unsupportable chemtrail and illuminati theories. Prince was a human being like the rest of us. Please respect the mans family, friends and his fans. As the dust settles this weekend, there does appear to be an important message Prince was making, and I would like to share my opinion on it. We are saddened he died so young, but let’s see what we can learn from his life. Before anything else here’s a video of Prince’s performance at the Super Bowl half time show in 2007. It is partly in tribute, but I will refer to the first song in the video “lets go crazy” a few times as we continue. Please watch this video before continuing. The first of several oddities that are being talked about today is where Prince’s body was found. Several news outlets including Entertainment Tonight are reporting LA Reid, one of Princes close friends recalled “One time when I was with him privately, he said, ‘You know what the elevator is, right?’ I said, ‘No, what’s the elevator?’ He said, ‘Well, the elevator is the devil,’” Reid shared. In the song “lets go crazy”, which starts out as a preacher giving a sermon, “dearly beloved we are gathered here together” Prince eerily warns us about the devil bringing us down, and uses an elevator to represent the devil. 34 years later, just this week, Prince dies in an elevator. I find it very weird that a song written 34 years ago which starts out as a funeral eulogy “dearly beloved” just a few words later, predicts the same artists death precisely. Prince seemed to know that what he was doing was wrong and he occasionally revealed to the rest of us how tormented he was on the inside. His symbol, the androgynous male and female symbol combined with a trumpet (7 trumpet judgements open up the apocalypse in the New Testament Book of Revelation) did seem to be prophetic again, and perfectly represented his apocalyptic version of life and sexual perversion “party like its 1999″ and “Darling Nikki” etc that was reflected in all his songs. 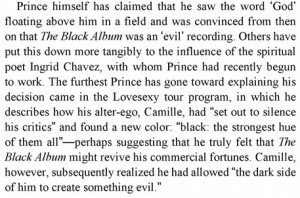 In the book “Prince, Chaos, Disorder, and Revolution” by Jason Draper we find this interesting story surrounding Prince’s “Black Album”. Prince thought the album was cursed and he begged Warner Brothers not to release it. I had to take two screenshots because I couldn’t make the google-book fit to screen, but here you go. Whoa Nelly, hold it right there! Prince had an alter ego “Camille”? Where have we heard that before? Thousands of years ago Greek philosophers Plato and Socrates taught us that the alter-ego controlling the actor was actually the “Demon” or the “Muse” and should be embraced. We often see dancers on the stage or television who perform SO AMAZINGLY WELL on the stage, after the show they will recount how she was, “outside her body watching herself dance”. We see alter ego’s in numerous musicians, David Bowie’s Ziggy Stardust, Beyonce Knowle’s Sasha Fierce, and hundreds of others all around us today. It is well known many of Hollywood’s most elite actors channel spirits who help them “become a vehicle for the character”. These same actors and actresses readily tell others how they did such amazing jobs by “emptying myself and letting the spirit inhabit me”. 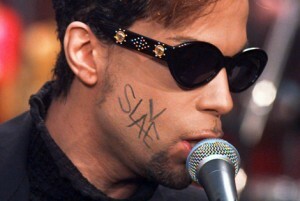 Prince seems to know he was being controlled as evidenced when he later paints “slave” on his face, shortly after the Black Album controversy. The only question is what was he being controlled by? Certainly the record labels are the usual suspects but what about this female alter ego we have never heard about except buried in the back pages of a seemingly inconsequential biography? Did Prince have a demon or several demons? Did this demon channel through Prince these apocalyptic false prophecies such as “purple rain” and “1999″? (newsflash its 2016 and were all still here) Was Prince’s death channeled 34 years ago in the song “lets go crazy”? I guess it all depends on what you believe but I have presented to you the evidence. To wrap it up, we need to ask ourselves 2 big questions. First, how much fame and stardom do we really want in this life? Take a look at our favorite “stars” like Prince. Look at him in his success. He tells us he was still a slave. 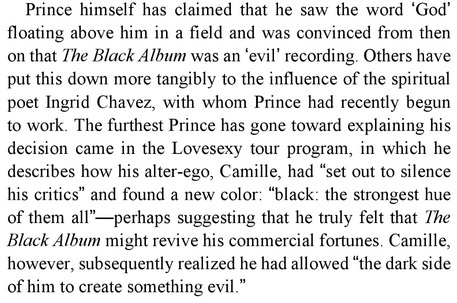 Prince was warning all of us of the evil & darkness at work in the world and specifically the entertainment industry. Beware! A better question to ask is this. How much freedom and liberty do we want in this life? The greatest freedom in life is through Christ and Him only. Hollywood, the entertainment industry and other colorful traps all around us are often destructive temptations and vanities that will only enslave us in the end. Last thing is this. are we doing things that we know are wrong that we think we can’t ever change? This is a lie. While it is true we can’t change ourselves, through Christ, can we find physical and spiritual freedom. Prince seemed to know he was being tormented and he couldn’t break free. This reminds me of the bible verse warning us about misunderstanding our freedom in Christ. Here is one verse taken from 1 Corinthians 6, but I encourage everyone to read the whole verse in its entire context here. While we can only speculate what power Prince was under, I say don’t worry about Prince anymore, he is in eternity now. We can not judge Prince or his actions or his songs, but we can take a hard look at his life and learn by his examples, good and bad. Prince seemed to be a highly enlightened individual who was aware of the spiritual world around him. I pray that Prince actually found forgiveness in Jesus Christ (the Word who became flesh, according to John) and did not die under the power of anything else. We don’t know for sure. This is just a quick opinion and observation piece on my part. Several other strange “coincidences” surrounding the death of Prince are being circulated and discussed all around the internet today. I won’t go over any of the other discussions. Some of it is probably true, all of it sensational! I provided a link to Clyde Lewis’s article back at the beginning of this article and that may be a good place to go if you still want to read more. This entry was posted in entertainment industry, music industry and tagged Entertainment, Prince on April 24, 2016 by mikeuslan.